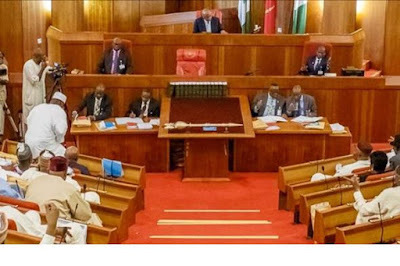 Members of the Senate raised various security issues at the plenary on Tuesday, making the lawmakers to resolve that heads of all security agencies in the country be summoned to explain the reasons for the proliferation of arms in Nigeria. SP Bukola Saraki also announced that the chamber had given IGP Ibrahim Idris another invitation to appear before the lawmakers at the plenary on Wednesday (today), which will be broadcast live. Senator Chukwuka Utazi (PDP, Enugu-North) raised a point of order to inform the Senate about the bombing of the home of the President-General of the Ohanaeze Ndigbo, Chief Nnia Nwodo. Nwodo’s house at Ukehe, in the Igboetiti Local Government Area of Enugu State, was on April 29 attacked with an improvised explosive device, which destroyed parts of the building. Also, Senator Tijjani Kaura (APC, Zamfara-North) raised a point of order to lament the rising spate of killings and kidnappings in Zamfara State. Saraki, in his remarks on the issue of Zamfara, restated the need for the IG to address the Senate on the security crises across the country. He said, “Again, it is an unfortunate incident in Zamfara, which is on a daily basis. It is of a great concern to us. We, at the National Assembly, must play our role to see what we can do to tackle this insecurity issue. “It is unfortunate, as we said last time, we expect the IG here. We have given him again till Wednesday to come here so that we can truly engage and address these problems. This is the biggest problem we are facing today in the country. The Punch reports that the IG had twice failed to appear before the Senate to explain the alleged inhuman treatment of Senator Dino Melaye during his arrest and detention by the police over alleged gunrunning. The police boss was also asked to brief the lawmakers on efforts being made to check the spate of killings by armed herdsmen and militias across the country. The resolution on Tuesday to summon the security chiefs followed the adoption of a motion titled, ‘Proliferation of Dangerous Firearms in Nigeria’ by Senator Suleiman Hunkuyi (APC, Kaduna-North).